It’s a priceless experience to stand inside Independence Hall, where the nation’s Declaration of Independence and Constitution were debated and signed. Imagine representatives from the original 13 colonies coming together in Philadelphia. Imagine how that diverse group of patriots from different religions, social positions and slavery opinions overcame all obstacles and created a new nation unlike any other. Independence Hall was built to be the Pennsylvania State House. The legislature loaned the Assembly Room for meetings of the Second Continental Congress and the Constitutional Convention. So much happened in that room. In 1775 George Washington was appointed commander-in- chief of the Continental Army. In 1781 the Articles of Confederation were adopted. In 1787 Ben Franklin viewed the rising sun on the back of Washington’s chair and found it appropriate for a new nation rising. Opposite the Assembly Room is the Courtroom of the Pennsylvania Supreme Court, which served that purpose in the 1700s. In addition to a number of significant trials, an act of rebelliousness happened on July 8, 1776. British King George III’s coat of arms was defiantly torn down by a group of Pennsylvania militiamen that had charged into the building. On the second floor of Independence Hall are Long Gallery, Governor’s Council Chamber and Committee of the Assembly Chamber. Long Gallery became a hospital for wounded American prisoners during the British occupation of Philadelphia. Later the room became one of America’s earliest museums, Peale’s Museum. The Governor’s Council Chambers was the scene of fugitive slave trials in the 1850s. Ironically, the Committee of the Assembly Chamber served as a holding area for fugitive slaves prior to trial, directly above the very room where the Declaration of Independence was signed. The Great Essentials exhibit in the west wing of Independence Hall includes documents from the 1770s and the inkstand that was likely used in signing the Declaration of Independence. of the Declaration of Independence with Jefferson, John Adams and Franklin. Independence National Historical Park, part of the most historic square mile in the United States, has plenty of options to fill any itinerary. 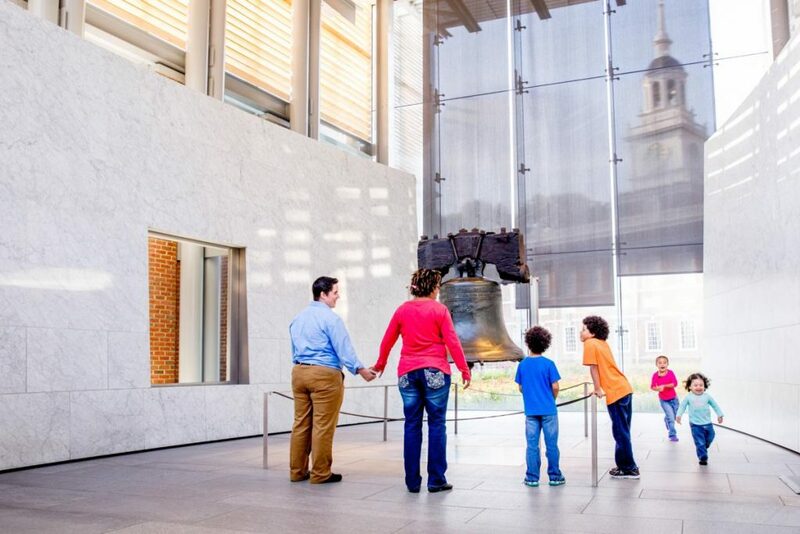 A must-see is the Liberty Bell Center. The story of how this ordinary statehouse bell has become a significant message of liberty to the world is fascinating. Ordered from a London Foundry in 1751, the bell cracked on its first use. Two Philadelphia metalworkers melted it down and cast a new one. 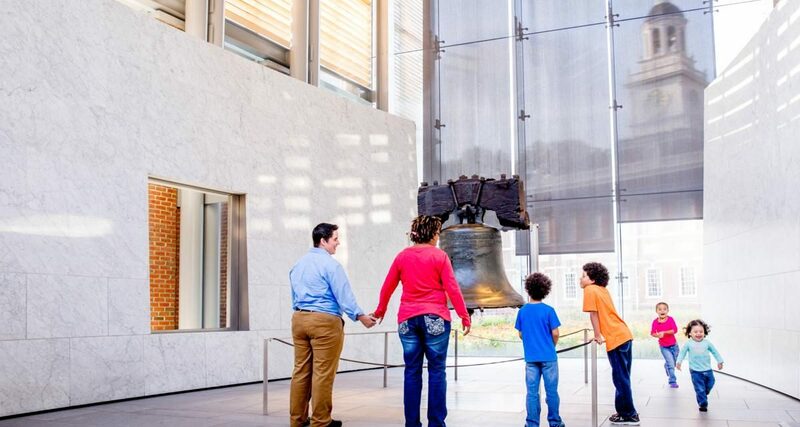 With its inscription clear, “Proclaim Liberty Throughout All the Land Unto All the Inhabitants thereof,” by the 19th century the bell had become a herald of liberty. From 1790 to 1800 the Philadelphia courthouse became Congress Hall. Both Presidents Washington and Adams were inaugurated here. Carpenter Hall was the site of the First Continental Congress and also Franklin’s meeting with a French spy that led to the French Alliance. Upon entering Franklin Court the first thing you’ll see are steel “ghost structures.” Although Franklin’s home and grandson’s printing office were demolished in 1812, the steel structures help visitors imagine the size of the property. The Benjamin Franklin Museum, located in Franklin Court, pays tribute to the contributions and character of the great patriot with educational, challenging and fun displays. The replica Franklin Court Printing Office showcases the importance of the printed word in the founding of the nation. Extend your historical area itinerary with one or more of these additions: Portrait Gallery in the Second Bank, Old City Hall, National Constitution Center, Edgar Allan Poe National Historic Site, Thaddeus Kosciuszko National Memorial and the Museum of the American Revolution. Begin your planning at nps.gov/inde/index.htm and visitphilly.com. The famed Benjamin Franklin Parkway is celebrating its 100th anniversary in 2018. This tree lined boulevard travels from City Hall to the steps that adorn the Philadelphia Museum of Art. More than a dozen museums and attractions grace the parkway. Following the historical theme, two stops that epitomize the city’s art history and heritage are a must. The Barnes Foundation, by the numbers, is incredible. With 181 works by Pierre-Auguste Renoir, it’s the largest single group of the artist’s work in the world. There are 69 works by Paul Cezanne, 59 by Henri Matisse and 46 by Pablo Picasso. The story begins with Dr. Albert Coombs Barnes, born in Philadelphia of working-class parents. After accumulating his wealth, he began collecting in 1912, and in 1922 the Barnes Foundation was chartered as an educational institution dedicated to promoting the appreciation of fine art and horticulture. The Barnes house and arboretum displayed the collection. Today, the Barnes Foundation art collection is presented in 23 individual galleries replicating the dimensions and shapes of the original house spaces where the collection had been shown since 1925. Pamphlets in every room describe each piece that’s on display. Docent-led tours are available for groups of more than 15. The Gardens Restaurant and Reflections Cafe are open for lunch. For more about the Barnes Foundation, visit barnesfoundation.org. 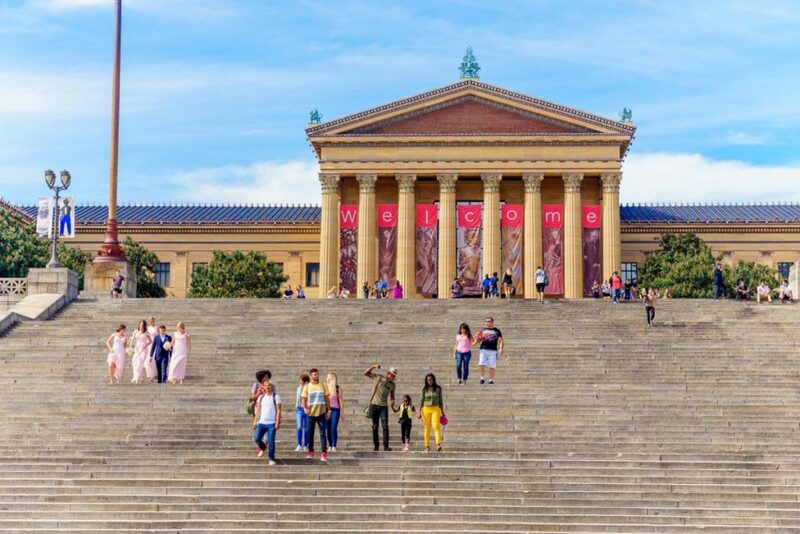 Even on a rainy day in January, as I approached the famous steps of the Philadelphia Museum of Art, there were visitors showing their best Rocky impersonations from the original Rocky movie. There’s a photo op with the Rocky statue located near the steps. Groups can avoid the steps by entering the museum from the rear at the will-call entrance. Art treasures from around the world are displayed in more than 200 galleries. A favorite of many first-time visitors is The Art of the Peales, America’s first artistic dynasty. Chinese Buddhist Art and Literato Pursuits: Chinese Paintings and Objects from the Scholar’s Study collections showcase the beauty of the Orient. The museum also presents regularly scheduled, multiple exhibitions featuring different mediums and themes. Through September 3, 2018, Modern Times: American Art 1910-1950 will be on display. Visit the website at philamuseum.org. For assistance in developing any Philadephia itinerary, contact Jim DePhilippo, 215-636-3312; jim@discoverphl.com. Begin planning online at discoverphilly.com.